Eating candy can cause cavities, tooth decay and even toothaches. Dentist in Eugene, OR Dr. Rita Feldmanis and her team wants patients to know that this doesn’t mean you have to skip Halloween. The holiday is all about dressing up and getting treats, but sometimes the treats can hurt your health. Eating extra sugar can be unhealthy, but here at Feldmanis Family Dental, we want to give you healthy tips for a happy Halloween. Buying sweet treats for you home could be a tricky when you have little kids sneaking pieces. It is best to buy healthy alternatives to sugar filled foods. Try getting sugar free gum. This is a great treat to give at Halloween and it can help improve your smile. When your buy candy for Halloween, pick healthier alternatives, but also set a special time for treats. When your children return from trick-or-treating, tell them to pick their favorite candy. Then put the rest away. You can hide it or even donate it to a food shelter. Establish a clear time to allow candy. This can help set ground rules so your family is not eating sweets all the time. When you family eats candy, drink water right after. This will help flush away sugar and food particles. Water is a great way to detox and stay healthy. 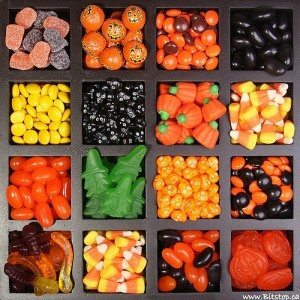 Allow your children to eat candy, but teach them about moderation. This can help build healthy habits from an early age. Eat with your children and do it in one sitting. This can help your family be present and this can prevent stomachs form overeating. Halloween is a perfect time to update your oral health care routine. You can buy a new toothbrush or a new flavor of mouthwash. Encourage your family to brush and floss after they eat their candy. This will help build strong habits. Use fluoride to help fight cavities. Remind your children to brush and floss twice a day for at least two minutes. Then they can rinse their mouth with mouthwash. Fluoride treatments can help prevent cavities and help build strong healthy teeth. Keep your child’s teeth healthy with regular visits to dentist in Eugene, Oregon Dr. Rita Feldmanis. Call 541-344-3393 to schedule your appointment!